On the day you begin your ESL course with us here in the U.S.A., it is important to know the basics of time management. Whatever comes up – either in class, outside activities, daily life errands and tasks such as shopping and laundry, scheduling calls and emails home – write everything down, and revisit your calendar at least once a day. Write down everything in one place! 2. Be sure not to forget downtime. Schedule it, and include a ‘rewards time’ for occasions like the end of exams, the end of a challenging week at school. Time management does not mean wall-to-wall work. Things come up that you do not want to miss. If the most important dates in your schedule – things like exams, for example, or studying for them – do not clash with something you really want to do, then make sure to fit it into the schedule. Move things around a little and notify people if your changes affect them. Once you know when you will be writing an important exam, good exam preparation begins with working backward from the exam date in your calendar. Then slot in chunks of time for studying that will effectively prepare you for the exam. Your method of studying is unique – be realistic about what you need to do and how long that takes when scheduling study time. 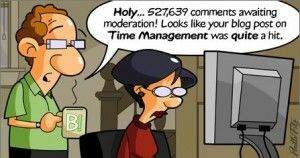 That is responsible time management. 5. Don’t leave anything till the last minute. Especially if you have a heavy workload. If you get sick or there is some unavoidable crisis, you will not be able to achieve your normal class requirements. If you find yourself with some time on your hands, do a little studying. Your sense of satisfaction from being in control of your time, rather than having it control you, goes a long way to alleviating problems like anxiety and frustration. Time management is meant to make your life easier, so see it in this context. It makes total sense to have a good time management plan in place because studying abroad by definition means that you have a certain time to attain the academic goals you have set yourself.